When J and I were dating for about 3 months, we would talk about how it would be fun to live in a place like Seattle or a foreign country one day (the farther away the more exotic). Looking back on those conversations, I can’t really remember why we wanted to live elsewhere – we were probably just saying things to impress one another!? That daydream turned into J getting a job offer in London and me following close behind. Our time in London was quite memorable for a variety of reasons, but it’s really where we found out that we could both tolerate one another for long periods of time. London’s weather rightfully gets a bad rap, but from June through August, that place is the best. From Feb through April, you’re lucky to see the sun at all. I’m guessing Seattle is pretty similar, and if it wasn’t for friends and family back home (no pressure guys), we would be living in the Pacific Northwest every year as soon as the weather breaks. I hate spending valuable bytes on weather talk, but 75 during the day and 55 at night without humidity is as good as it gets. Also, as we don’t really have constant air conditioning in the trailer and our shower situation is a little spotty, this weather is ideal for our current happiness. Starting our Seattle area adventure off right, we took a visit to Snoqualmie Valley Hospital. Wait, what!? Yup, it’s not an official D Family summer outing until someone makes a visit to the hospital (ask my Dad about how much he liked taking me to the hospital every summer). The reason for our visit was we had a 3 year old telling us her belly hurt for the past 4 days. 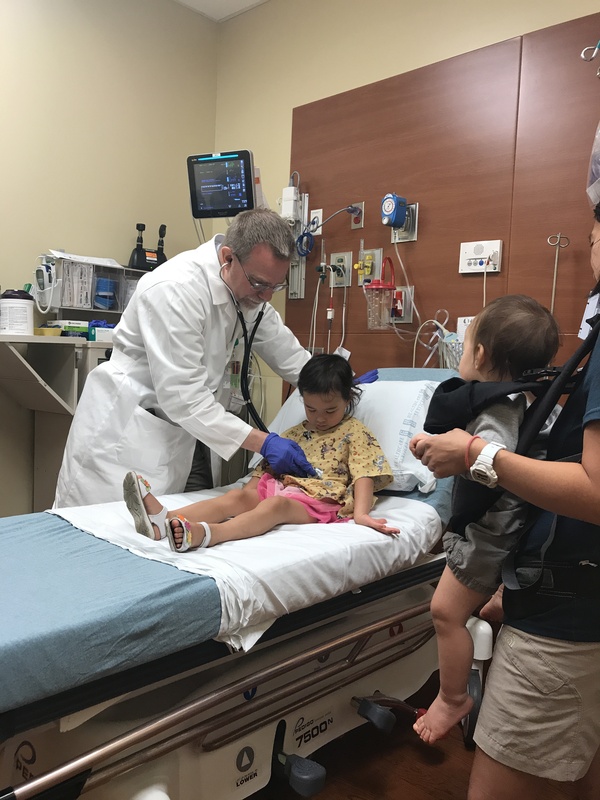 E has never complained about anything health related before and she’s rarely sick (knock on wood), so we thought it best to get her checked out – especially when her hiking speed was slowing us up! Don’t worry though, she checked out a-ok and enjoyed the visit when she got her “favorite food of all time” as a reward – Sunchips. Kids are pathological liers by the way. E has never had Sunchips before, but she told the Doctor that they were her favorite food ever. Soooo, of course we have to track them down for her after the Doctor says, “E was a brave and good patient and deserves her Sunchips now.” Thanks Doc. Kidding aside the Doctor and staff at the hospital were outstanding and our wait time on a Sunday morning was only 3 minutes. Go Snoqualmie Valley! After that detour, we headed off to Snoqualmie Pass for a night camping in the Cascades. We once again lucked out and got the last campsite in an idyllic National Forest spot (without any dudes taking target practice this time). Not to overstate our love for the PacNW, but one of the reasons I really wanted to take this trip was for the hiking in this part of the country. The trees are majestic and the understory is crazy interesting with all sorts of enormous ferns, colorful mushrooms, and soft pine needles to walk on. I kept looking for pots of gold and leprechauns, but all I found was my family. Leaving Snoqualmie, we made our way towards the Tall Chief RV park in the Seattle suburbs. We took it easy and really didn’t push it too much in Seattle, spending 3 relaxing nights at Tall Chief. This was a conscious effort as we are trying to slow down our driving, sacrifice a tourist spot or two, and just enjoy our surroundings a little more. The difference between staying 1 night at a spot and 2 or 3 nights is yuuuuge. While there, D got to hit Duthie Hill Bike Park, where he promptly broke the derailer on his bike, doing an obstacle he’s probably too old to do. Thankfully, he avoided a second trip to the hospital, but the bike park was outstanding while it lasted. Outside of enjoying Seattle and living like locals, we did have fun down at Pike’s Place doing the tourista stuff there, but we nearly got Gringo (our truck) stuck in the smallest parking garage known to man. On the way out of the garage I said to the parking attendant, “little tight back there huh,” to which he gave me a look that said, “you’re the a-hole who’s driving a half ton pickup truck in the city.” Touche’ my friend, touche’. Note – checkout the before and after photos below of Lil D hiking on J’s back. The first is the two of them living in parental-child harmony. The second is Lil D pulling J’s hair in a supreme fit of rage. This is what really takes place on our hikes. J nearly coming to tears, not because of the beautiful surroundings, but because of our 1 year old yanking on her hair like a bucking bronco.